Free Relationship Tests - Is Your Ex Holding You Back? What Can be Found Out with Free Relationship Tests? If you're looking for free relationship tests, you've landing at one of the right places. Wondering if you obsess too much about your ex? Maybe your ex is holding you back from a great relationship you could be having. Take this free test to find out. How were you tested in the past? Have a test or quiz? Share it here! Question #2 - How do you feel about the special "place" you used to have with your ex, such as the special bar, restaurant, or café? Question #3 - You feel an urge to go and see your ex. What do you do about it? All A's - If you answered all A's on your free relationship test, your ex is definitely getting in your way. What you need to realize that is just accidentally emailing your ex or trying to run into them is not going to get them back into your life. Pack away the gifts and remember the good days, but let it go. This is getting in the way of a great relationship you could be having. All B's - All B's on the free relationship test means you have gone a bit overboard with getting over your ex. Sure, you're ready to move on, but remember some things from your past relationship. Remember the good parts. Learn from the mistakes. Learning and remembering can help you to make sure your next relationship is that much better. 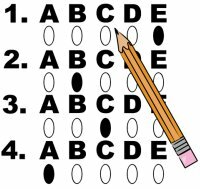 All C's - If you took the free relationship test and got all C's, you are much better off without your ex. Sure, you still have thoughts about your ex and appreciate all that you had in the relationship, but you are ready to find something that will be more satisfying for you in the end. Return from Free Relationship Tests back to the Facing Relationship Tests page.